The combined capital city preliminary clearance rate rose to 76.9 per cent this week, increasing from last week, when final results saw the clearance rate fall to 69.8 per cent after 10 consecutive weeks remaining in the mid-70 per cent range. The rebound in the preliminary clearance rate has occurred against a backdrop of higher auction volumes, with 2,347 properties taken to auction across the combined capital cities, up from last week’s 1,751, however lower than one year ago (2,675). The higher clearance rate and increase in volumes this week were attributable to stronger results across the two larger auction markets of Melbourne and Sydney, with performance across the remaining capitals remaining varied over the week. Considering the slowdown in auction markets over previous weeks as well as widespread speculation that the housing market is moving through its peak, the final auction clearance rate, published by CoreLogic on Thursday, will be an important follow up to this strong preliminary result. Across Melbourne, 79.9 per cent of the 1,087 reported auctions sold this week. There were 1,232 auctions held across the city this week, rising from 828 last week when the final auction clearance rate was 75.2 per cent and lower than the 1,404 auctions held one year ago, with a lower clearance rate (73.5 per cent). The Inner region of Melbourne had the highest number of auctions this week (222), with a preliminary clearance rate of 75.1 per cent. Meanwhile, the strongest clearance rate was recorded across the North East region and North West region, with 88.4 per cent and 82.9 per cent of auctions clearing respectively. In Sydney, 804 properties were taken to auction this week with a preliminary clearance rate of 78.4 per cent, increasing from last week when the final clearance rate for the city was 72.4 per cent, across 596 auctions. One year ago, 818 Sydney homes were taken to auction and the clearance rate was 71.7 per cent. This week, the performance across Sydney’s individual sub regions was mixed. Across the Eastern Suburbs region, where 40 results have been reported so far, the preliminary clearance rate was 75.0 per cent, while across Inner South West (88.0 per cent) and Baulkham Hills and Hawkesbury (84.2 per cent) the success rate of reported auctions was much higher. Brisbane was host to 124 auctions this week and so far 87 results have been reported, with 56.3 per cent sold. Last week, auction volumes across the city were higher with 134 auctions held across the city and a 44.3 per cent clearance rate recorded. The number of homes taken to auction this week increased across the Gold Coast with 67 properties up for sale this week. Of the 28 results reported, 53.6 per cent were successful. This week, Adelaide saw a preliminary clearance rate of 65.4 per cent, with 52 reported results across a total of 82 scheduled auctions. 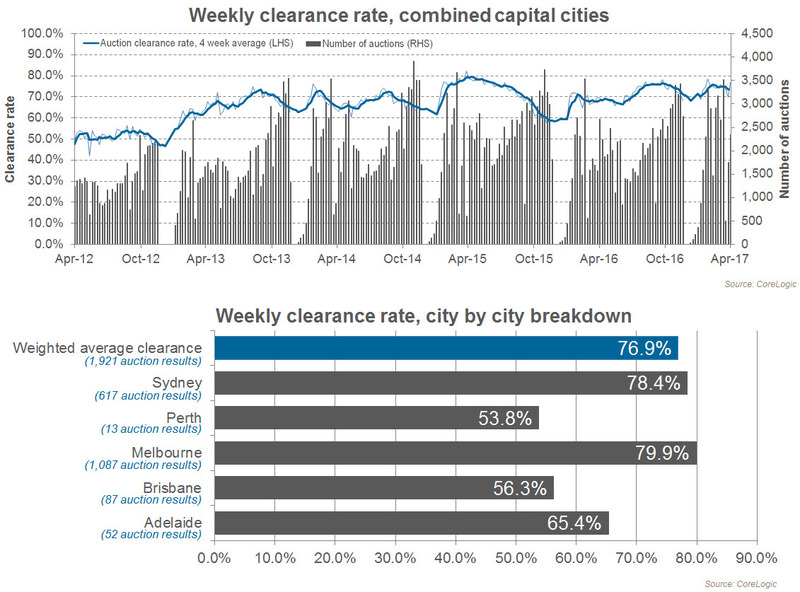 In comparison, over the previous week Adelaide’s clearance rate was 58.2 per cent and 61.0 per cent one year ago. In Perth, 33 auctions took place this week, with 13 results reported so far. Perth’s preliminary clearance rate of 53.8 per cent across these 13 results is higher than both last week’s result (23.5 per cent) and the clearance rate from one year ago (48.7 per cent). Canberra’s preliminary auction clearance rate of 67.9 per cent this week is lower than last week, when the final auction clearance rate was 69.4 per cent and higher than the 59.1 per cent recorded last year. Tasmania saw 10 auctions take place this week, 9 results have been reported so far, with 6 sales. ← Overseas investors cash in on the UK property market?